DUI accidents happen every day. It is sad, but people are injured or killed in drunk driving accidents every single day. If this happens to you or one of your loved ones, then you need help and you need it as quickly as possible. The Griffin Law Firm has the experience you need to make sure you will be fully compensated if you or a loved one is the victim of a DUI accident. To discuss your case and get the answers you need, we recommend that you call us today at 877-529-7070 or 877-PAIN-LAW. Personal Injury Claims involving DUI: DUI Accidents are auto accidents that involve negligent drivers who are driving while intoxicated on drugs or alcohol. Drunk driving is treated differently because Georgia law views this as a reckless disregard for human life. it is more than simple negligence. This is why Georgia law allows injured parties to recover for punitive damages in personal injury claims involving DUI drivers. Why? Because the Georgia legislature is trying to add additional damages to punish and deter this egregious conduct. Wrongful Death Claims involving DUI: Wrongful death claims are auto accident claims that result in a fatality rather than just an injury. In wrongful death claims in Georgia punitive damages are also available just like they are for personal injury claims. In wrongful death claims, the surviving spouse or surviving child can recover for the value of the lost life both economically and non-economically. The economic value of the lost life is the lost income that would have been earned. The non-economic value of the lost life is the value of the life from the perspective of the deceased individual. Workers’ Compensation Claims involving DUI: It is possible to have a personal injury claim with punitive damages, as well as, a workers’ compensation claim from the same accident. An example of this would be an auto accident involving a moving truck that was caused by another driver’s negligent driving. Another example would be a slip and fall injury that occurs at your work that involves a third party cleaning company negligently causing a slipper floor. The injury attorneys at the Griffin Law Firm know how to maximize your recover for each of these claims because we are experts in both personal injury and workers’ compensation. What is required to have a workers’ compensation and personal injury claim from the same accident? You were injured and require medical treatment. Investigation: Our Atlanta personal injury lawyers will obtain the police report and the arrest report when the accident involves a DUI driver. We also will make sure we obtain the final disposition of any DUI criminal charge. Sometimes we are even able to obtain the police video of the arrest at the scene which can help a jury understand better just how impaired the DUI driver was. Criminal History Investigation: The personal injury attorneys at the Griffin Law Firm will also investigate to see if the defendant is a repeat offender for DUI. Repeat offenders are people who have a history of drunk driving. This can often greatly increase the value of the case since jurors will usually award much higher punitive damage amounts when the DUI driver is a habitual offender. This is because greater punishment is arguably needed to deter this horrible conduct that appears to be a habit not a rarity. Medical Assistance: Attorney Richard Griffin will help you pick the best doctor available under your health insurance. If you don’t have health insurance, then we will help you find a doctor who will treat you on a doctor lien. A doctor lien means that you don’t pay for the treatment as it is received. The treatment is paid after your personal injury case is resolved. We also help you get the diagnostic testing, pain management, or even surgery you need through the use of medical funding companies when you don’t have health insurance to pay for it. Insurance Coverage: We are often able to negotiate policy limits settlements for personal injury and wrongful death claims involving drunk drivers. This means that it is even more important to hire our attorneys to make sure that all insurance policies are located and that all policy limits are verified. If you don’t handle this correctly, then you can lose your right to recover against under-insured motorist policies and umbrella policies. This could cost you hundreds of thousands of dollars so it is important not to go it alone. About 12,000 people die every year in auto accidents that involve drunk driving. About every 90 seconds someone is injured in an auto accident involving a DUI driver. About 1,200,000 arrests are made for drunk driving every year in the U.S.
About 33% of the DUI arrests involve repeat offenders. About 50% to 70% of the drivers convicted of drunk driving continue to drive on a suspended licease. 90% of the time drunk driving occurs after drinking with friends and family. 32% of all DUI drivers each year are between the ages of 21 and 24. 30% of all DUI drivers each year are between the ages of 25 to 34. 24% of all DUI drivers each year are between the ages of 35 to 44. There are approximately 300,000 incidents of drunk driving every single day. About 28 people die every single day due to drunk driving. It is estimated that most drunk drivers have driven drunk 80 times prior to their first arrest for drunk driving. Why does the adjuster have the advantage over you? The insurance company has the advantage if you attempt to represent yourself in a personal injury, wrongful death, or workers’ compensation claim. Why? Insurance adjusters know how to defend a claim. Insurance adjusters have defense attorneys at their disposal. Insurance adjusters know that without an attorney you don’t know the value of your case and can’t litigate. Insurance adjusters feel empowered to dictate to you the terms of your settlement because they know you are at their mercy unless you have representation. Client Testimonials: We believe that you must review the client testimonials to know how our clients feel about us. Firm Awards: You also must review the firm awards to know how the legal community feels about us. Settlements and Verdicts: Lastly you must review the firm’s settlements and verdicts to know that the firm can deliver great results. 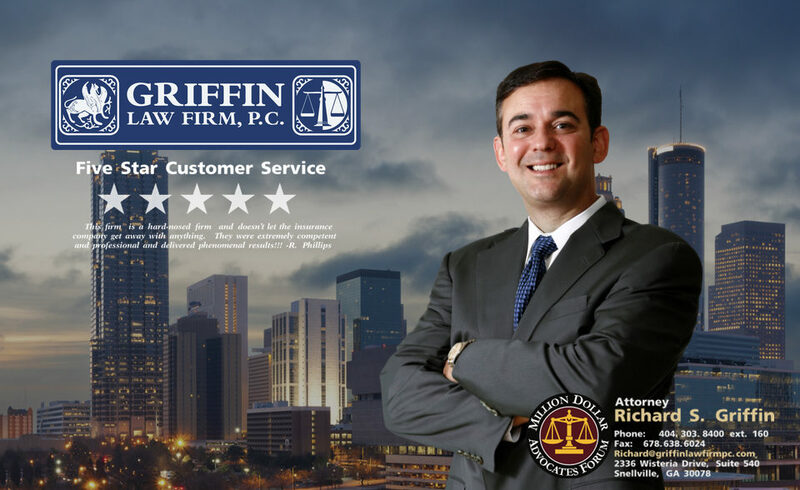 Free Consultation: The Griffin Law Firm is ready and willing to discuss your case with you for free if you call us at 877-529-7070 or 877-PAIN-LAW.